In the safety industry, it has been long thought that the application of training focusing on methods and procedures, combined with the safest equipment and tools, is the ultimate workplace safety solution. Whilst research (Beus et al. 2015) has found that safety climate perceptions accounted for the majority of explained variance in safety-related behaviour and that the existence of a clearly established safety climate was found to be the biggest predictor of a safe workplace, there is more to the story than this. More recent research would suggest that the safety philosophy only addresses part of the issue. I have an active interest in the link between workplace safety and personality and the extent to which an individual’s behaviour plays a key role and whether safety in the workplace can be further improved by considering the psychological makeup of the employee. More recent research would suggest that taking personality factors into account is crucial to creating and maintaining a culture of safety. How can personality affect individual safety related behaviour? It is a well established fact that personality factors influence behaviour, but specifically what I’m interested in is how an individual’s personality can affect their propensity to behave safely, in a workplace where safety is critical. Within this article I’m referring to an individual’s willingness to involve themselves in safety related behaviour and not referring an individual’s likelihood of becoming injured whilst working, which is also controlled by factors beyond the individual. A study by Beus, Dhanani and McCord (2015) looked at personality and safe behaviour in the workplace; they focused on which people were more likely to engage in workplace behaviour that is defined as safe and stay away from behaviour defined as unsafe. This meta-analysis study focused on the Big Five personality traits which underpin many psychometric surveys (extraversion, agreeableness, conscientiousness, neuroticism and openness to experience). The study found that individuals with higher levels of extraversion had higher levels of unsafe behaviour; this was accounted for by extraverted people having a need to “get ahead” and achieve higher status and they may be willing to compromise on safety in order to achieve this (Beus et al. 2015). Those with higher levels of neuroticism were also associated with higher levels of unsafe behaviour – this due to a propensity to be consumed with anxiety causing potential distraction. Neurotic individuals are also more likely to let anger lead to irrational or impulsive decisions, which could result in safety protocols not being fully observed. Beus et al. (2015) found that agreeable individuals demonstrated less unsafe behaviour. This has been attributed to them being more cooperative and far more willing to carry out actions which benefit the needs of the whole team. Fairly unsurprisingly, conscientious individuals were also associated with less unsafe behaviour. Their naturally meticulous natures and willingness to conform to rules makes them more likely to avoid risky or unsafe behaviour. Out of interest, the final factor of openness to experience, based on a need to be adventurous and individualistic, was not found to have any relationship with unsafe behaviour. Are certain personalities safer than others? So there is a suggestion from this meta-analysis that there is a link between certain personality factors and propensity for safe behaviour in the workplace, with facets such as sensation seeking, altruistic or impulsive all showing a meaningful association with unsafe behaviour. These are all facets and traits that can be identified using psychometrics at the recruitment phase, or as a development tool for existing staff, giving organisations the opportunity to identify individuals with these traits as dominant. So, if certain types of people are safer than others, surely there is a value to an organisation taking this into account and making a conscious effort to identify these individuals, for an environment where safety is critical. An individual’s personality is not set in stone and people can adapt their behaviour when required to situations and do fluctuate according to environmental factors. The context in which we operate interacts with our personality characteristics to define our behaviour. But there are traits within people that determine how we are more likely to react that will govern our behaviour. Whilst as individuals, we may work against our default behavioural style, we may struggle to do this reliably on a continuous basis. Which may make us unsafe in a critical environment. Bearing this in mind, it may be worth organisations within the safety industry considering not how to change the personality traits of their staff members through training in order to ensure conformity to procedure, but how to design their safety related training to take into account the individual differences of staff and assign job duties to accommodate these differences. Taking it further, organisations can take steps to hire safer people in the first place. Obviously this article only touches the surface in terms of considering the impact that an individual’s personality characteristics might have on their willingness to engage with an organisation’s safety culture. There are many more areas to consider, such as locus of control, emotional intelligence and optimism to name a few. 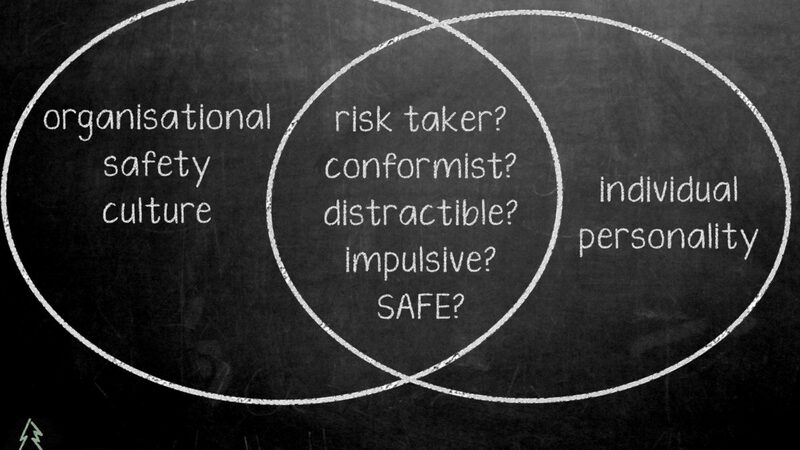 But hopefully this discussion will give some insight into the role that personality plays in the arena of safety. Lakeland Capabilities carries out psychometric assessments to identify strengths and areas for development for staff at both the recruitment and development stages. If you are interested in finding out more about how these assessments can be evaluated within the context of a safety critical role, contact us for a no obligation discussion.